Since the beginning of the membership drive, 27 new members have joined Salem City Club! Please join us on Friday, May 4 for a panel presentation and discussion about Oregon’s newly minted Marine Reserves program. We are pleased to welcome four speakers who have been deeply involved in the process of establishing Oregon’s marine reserves. Paul Engelmeyer has managed the Audubon Society’s Ten Mile Creek Sanctuary since 1991. He is a respected voice on Pacific Northwest conservation issues and he provides valuable information to state and regional fish and wildlife commissions. Engelmeyer is also Audubon’s Pacific Coast salmon specialist and is a recognized leader in exposing the plight of the now-threatened Coho Salmon in Oregon. Terry Thompson, a Lincoln County Commissioner, has been a life-long fisherman, having spent over 4,000 days at sea in most of the northeast Pacific fisheries, and has thus developed a unique perspective on marine habitats through hands-on experience. His education background at OSU included a degree in Education along with multiple courses in fishery and oceanography studies. Susan Allen is the Director of Our Ocean, a statewide coalition of conservation groups, small business owners, recreationalists and others seeking to sustain Oregon’s healthy ocean. She is also a marine conservation representative on both the Territorial Sea Plan Advisory Committee and the Department of Fish And Wildlife’s External Budget Advisory Committee. north of Newport, and a marine reserve and associated marine protected area at Redfish Rocks, near Port Orford. With a recommendation from the state’s Ocean Policy Advisory Council (OPAC) and three community advisory teams, the process has entered the next phase. Three additional marine reserve sites were just approved by the Oregon State Legislature, to be designated at Cape Falcon, Cascade Head and Cape Perpetua. Thus Oregon now joins California and Washington in protecting fragile state waters of the Greater California Current that spans from Alaska to Mexico. There are many Marine Protected areas and Marine Reserves worldwide, and many have been in place for decades. They were formed in response to ocean habitat destruction, increased demand for seafood, climate change, and increasing demand for aquaculture and non-seafood resources. They function as nurseries for sea life, allowing fish stock to reach maturity with associated maximal fertility and offspring; by and large this is what happens. The panel will explain the science behind marine reserves and the effects of reserves on ocean conservation. They will also discuss Oregon’s unique bottom- up approach to reach community consensus, which in turn led to the political accommodation needed to finalize this project. It is notable that all speakers took part in this process. *Detailed speaker biographies are available at Salem City Club. Please join us on May 4, 2012, at Willamette Heritage Center at the Mill as we host these knowledgeable and dedicated professionals. For lunch reservations email rsvp@salemcityclub.com before noon Wednesday, May 2, 2012. Parking is free. Doors open at 11:30 AM. For more information on this program please go to www.salemcityclub.com. 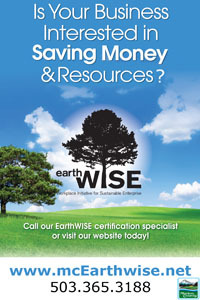 Thank you to earthWISE for sponsorship of this program.